The biggest, most persistent fear in my life is that there will not be enough for me. I worry that there won’t be enough money or time or luck. I worry that what I love has already been taken. I worry that I will have to keep proving myself worthy again and again and again. Lately, my life has proven this fear to be absurd. If 2011 was the year of anything, it was The Year of Gifts. While I have gone through my life thinking I never win anything, this fall I won a $100 bill during a random drawing and a few weeks ago, the Fairy Hobmother granted me a $50 Amazon gift card. This afternoon, my neighbors brought over the biggest stuffed dog I have ever seen. It’s bigger than Oliver and Gus put together and is now sitting on the couch in the funny back room of our house that is neither a porch or a sunroom. My neighbors are older and I am guessing that they have forgotten what Christmas is like with small children, when your house is strewn with new plastic toys and you keep running out of batteries. A giant stuffed dog is the very last thing I need and yet, it fits in perfectly amid the excess and the clutter. To me, it’s a sign of all I have. When they brought it over I imagined the universe laughing at me. You think there’s not enough? Well then get a load of this! 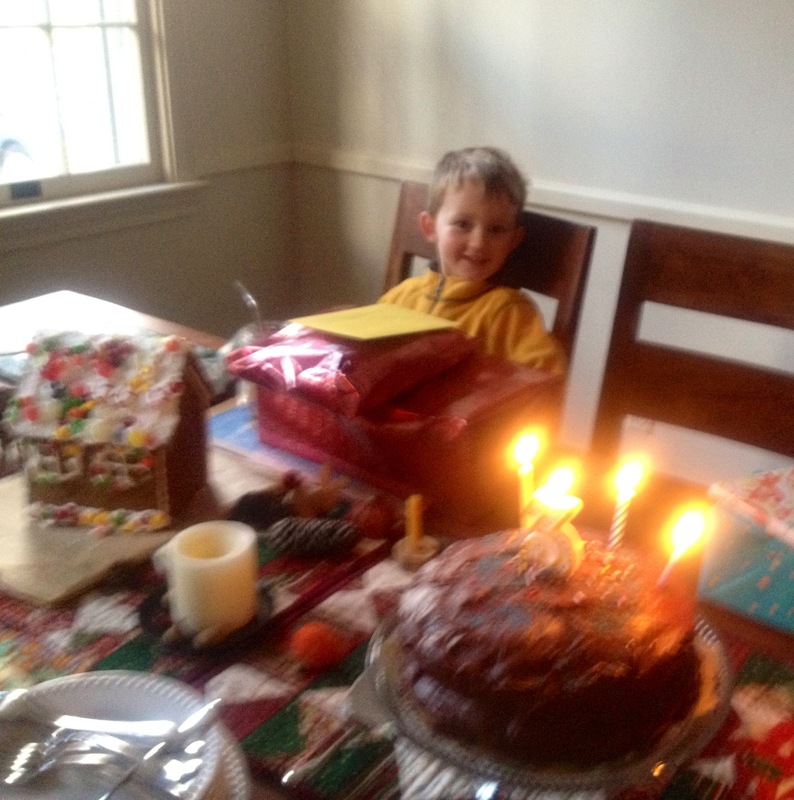 Gus birthday is January 3rd and pretty much the last thing anyone wants to do on that day is eat cake. And still, there I was, cracking eggs into a mixing bowl and melting heavy cream and chocolate for the frosting. So much sweetness, I thought as I poured in the vanilla. The other big gift of Kripalu was getting to meet Katrina Kenison in person. Not only do I admire and love her writing, but her first book, Mitten Strings for God, literally changed my life. I bought the book from a library book sale when Oliver was nine months old. We were living in Coronado, a small island off the coast of San Diego, and I remember the August afternoon I opened the book. It was warm and sunny and I was rocking in the blue denim glider, nursing Oliver. When Oliver was born, I was not really prepared to become a mother and even after nine months I was still surprised by my position in life. Katrina’s book was both a lighthouse for me and a map. She showed me another way to do things. Reading her book, I discovered that motherhood wasn’t something to achieve or plow my way through. On page 72, she writes, “To begin, we need only create a “listening” space, tune in to the world around us, and have faith that our own inner storytellers will guide us.” To me at the time, this was a revelation. That I even had an inner storyteller was news to me. After I was pretty sure I didn’t have to rush my mom to the hospital, I thought about Rolf’s words. If there was no line, then falling out of tree pose didn’t mean that my yoga class was ruined. If there was no line, then my mistakes in life didn’t automatically qualify me as a failure. If there was no line, then my mom having a stomach bug wasn’t going to ruin her trip to Kripalu. Such relief. The relief was instantly followed with terror. If there was no line, then I couldn’t pack all the moments I labeled as Wrong into garbage bags the way I took old toys to Good Will. If there was no line, then I would need to allow everything in. I would have to feel it all. On the night of January 3rd, after we were home, after Gus’ birthday cake was eaten and the candles blown out and the presents opened, I went out for a run. Usually, I am a morning runner, shuffling down the sidewalk before the sun comes up, but on Tuesday night, I was restless, sick to death of cake, and floating in a sea of Too Much. Sometimes, only a run will do, no matter that it’s bedtime and twenty-one degrees out. I headed down my favorite route along Russell Road where the bright streetlights lead to the King Street Metro in Old Town Alexandria. On my way, I passed a creche that was still up and it was so beautiful that I stopped right there, my breath steaming in the frigid air. A baby was in the manger and two wooden figures covered with beautiful cloth were kneeling beside it. In the wind, the figures were rocking, almost as if they were weeping. I thought that the gift of January 3, 2009, was the birth of my second son, whole and healthy, swaddled in his pink and blue blanket. But maybe the pain of labor was also the gift. I thought that the gift on the first Christmas night was that Jesus was born and was lying in a manger. But of course his death was the gift as well. I have no resolution this year, only the usual questions and worries and wonders. The gifts I received in 2011 are piled too high for me to wish for anything for this year. My two boys. My husband. Our home. My friends who live everywhere and my loneliness in this city. My yoga practice and all the suffering that brought me to my mat in the first place. The joy and the pain. The light and the shadows, all of them gifts, equal in measure. If you wish to be visited by the Fairy Hobmother, leave a comment here and she may bestow her gifts on you as well. And, I am giving my own gift of Mitten Strings for God to two people. If you read Mitten Strings for God, then I’ll send The Gift of an Ordinary Day. If you’ve read that, then I’ll send Meditations from the Mat (written by Katrina Kenison and Rolf Gates). And if you’ve read all of Katrina’s books, then you are a very lucky person. My only wish, my dear Pamela, is that you see, in this year to come, just what a gift you are. To me, to your friends and family, to the world. Love to you, and thanks. Amen to that, my beautiful friend. And to what Christa said. May 2012 be a year of gifts, celebration and Love. What a beautiful post. I love how you portray you and your mother. I am also blessed to resemble my mother in many ways, and I could hear someone saying that about Thing One and Thing Two about us. What a gift that is in itself, I need to remember that more often. I would love to have any one of Katrina’s books! I wish I could come over there right now and give you a hug. These words arrive as a gift for me, deeply humanizing, grounding, affirming of life and spirit. So thank you for being you and for having the courage to express that Soul-Self. Thank you for this article, your posts are gifts to me, your blog along with the posts from A Design So Vast (I believe it was one of her posts that sent me to you), are the only two blogs I await posts from, and devour the instant they come in. It’s like heart replenishment. I deeply appreciate your honesty, truth and sincerity in your writing, it speaks to me in a way that very little else does. That is definitely my gift this year, to have found your blog and your words. I wish you a very blessed 2012 🙂 Thank you for your post today and your giveaway. I have been wanting to read Mitten Strings from God for sometime, after hearing Lindsay from A Design so Vast mention it! Thank you, Pamela! So many gifts, and it is helpful to remember that sometimes pain is a gift, and loneliness is a gift. I am so grateful for your presence in my virtual world. I feel like I have another friend who gets it. I read the Gift of the Ordinary Day and it was my lifesaver this fall as I moved my family across country ( my 16 year old son and all) to live my dream(and just found out that Katrina is my good friend’s cousin-small world). And then, here I am having lonely moments and struggles and I wake up and I read your post. Rambling on right now, really wanting to just say thank you. And happy new year. Love. You always make me think, which is such a gift to ME. Happy New, Pamela. So happy to have found you and Katrina this past one! I’m sorry about your being lonely. I’m like that sometimes, even more so when I find myself busy socially. It has taken some time to figure that one out. A friend of mine has a daughter in second grade who is a little on the heavy side (just a little) , but more I think she is a deeper, older soul that makes it harder to find like minded 7 year olds. She told me, “It’s better to play by yourself than to play with those who are mean to you or those who bore you.” Amen, sister. Oh Pamela. I was so happy to see that you posted a new piece. It is, as always, exquisite. I love the open way you express your inner-most self, and the way in which you write about it lightens my load, always. Although we’ve never met “IRL”, I fell as if we have. I feel a kindred connection to you, through your words. I ran the other morning. And then that night, I still needed more. But since I’ve only just started running again (bad knees), I knew I couldn’t run again. So into the frigid night I went for a walk. With my raging PMS, threatening depression as companions I walked. And I thought of my life coach saying that the key is accepting each moment, each experience, as a gift. As I walked and the inner turmoil spilled down my face in the form of tears, I said, “Oh yes, and this too. This too.” A gift. I thank my lucky stars for you. Thrilled to see a new post from you in my Reader, dear one, and so grateful to you for these ruminations and reminders that fill me up and remind me that I am not alone in asking these questions. What I would have given to have been a fly on the wall at Kripalu, just drinking in the conversation between you and Katrina and Rolf and your mom. Pam, you are such a beautiful writer. Thank you for the gift of your friendship and your writing. I think it was Patanjali who wrote, “Pain is inevitable, but suffering is optional.” We tend to be attached to the way we think life at any moment shoud be, instead of embracing what is. I am guilty of this very attachment, but my resolution this year is: Less self-criticism, more self-love. Accept and let go. Thanks for the reminder that all our days are filled with gifts. Lovely to meet you here, Pamela. Every single one of your posts is a gift you send through your computer, out into space, where we can each grasp it for a moment, feel its warmth and bask in its glow. Here to accepting all our gifts with an easy, open heart in 2012 and beyond. What a beautiful post. Almost peaceful. I have to admit I am not usually a long post reader. I read at work and find myself rushing through the reading. Yours drew me in and washed over me. I am glad I stayed till the end. After reading this post, I was thinking perhaps I should pick up and read Mitten Strings for God. I am currently searching, searching, and searching more. Perhaps this book has some answers for me. Thanks for writing this blog. Your words are beautiful. The pain of labor…perhaps one of the most present times of my life, inhabiting my bod completely. I’ve read Gifts of an Ordinary Day and would love to read Mitten Strings. This is what I am learning; this is what Hakomi has taught me. Not the words, but the experience, what it feels like, for everything to work out, to make space for that possibility, to receive what comes. I still remember very early on in my Hakomi training when I went to lunch at a restaurant with fellow classmates (all of whom were more experienced — way more experienced! — than I) and I was nervous but happy. We chose some place that took separate checks because barely anyone had cash and but then when the time came the server said, “No, we don’t do separate checks,” and I had this momentary sense of panic, like “Oh no! What will we do? !”, it was a feeling I wasn’t even aware I was having until a couple of folks said, “Oh, okay, well, we’re work something out,” and I thought, “Of course! Yes, I am here with Hakomi people. We will work something out.” A million possibilities. Because everyone there was open to possibilities while knowing their own limits and needs. It’s called reality, or rather, all of reality. The inside and outside of it. And it seems to me that we need both for things to work out. My God Pamela. EVERY TIME I come here, I leave filled with the beauty of your words, but even more in awe of how closely you pay attention to your life. I’ve learned so much since becoming a mother, that I almost wish I could go back and labour for both my boys again, to sit with the pain and the beauty it was bringing for just a moment longer. It’s an odd way to feel, but I feel it acutely. I think it’s because until recently I didn’t realize what it meant to pay attention and to be fully aware of the gifts we receive. It’s such a joy to know you. You are currently reading Gifts at Walking on My Hands.